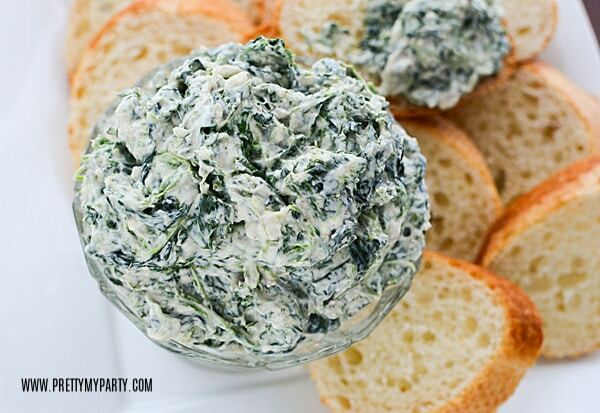 Are you ready to make the Best Spinach Dip Recipe ever? 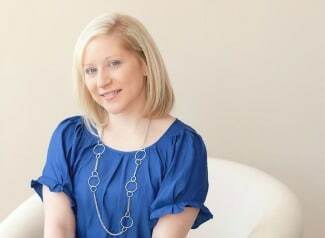 You’ll be amazed at how easy and simple this will be to prepare for your next event! 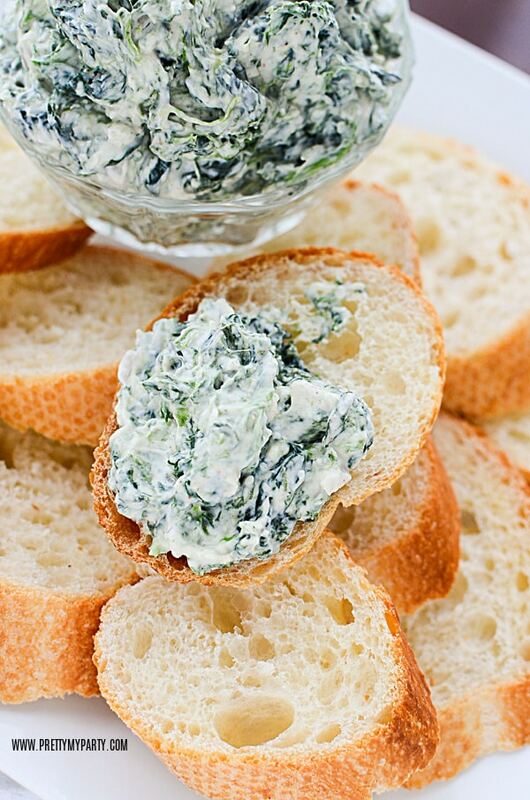 This easy Spinach Dip Recipe makes the perfect appetizer for any party. Whip this dip up in advance and you’re ready to entertain, or you have the perfect addition to take to any party that you are attending. Either way, we have you covered! Even better? You won’t have to worry about breaking the bank when it comes to prepping this easy appetizer. With just a few simple ingredients, you’ll be ready to go and impress anyone who tastes this Best Spinach Dip Recipe. When making this awesome Spinach Dip Recipe, the first thing you’ll need to do is head over to the grocery store and pick up your ingredients. But no worries, because everything is super simple to grab and there isn’t anything you’ll be worried about finding. That’s always a huge bonus for me, when all I want to do is find something that is easy to make, fast to create, and DELICIOUS! Below, you’ll find the ingredients you’ll need to prepare the Spinach Dip that will become your new go-to party appetizer! You may also want to consider what you plan to serve the Spinach Dip with, as well. Think bread, veggies, chips or crackers. Pick up whatever you may need at the same time, as well! 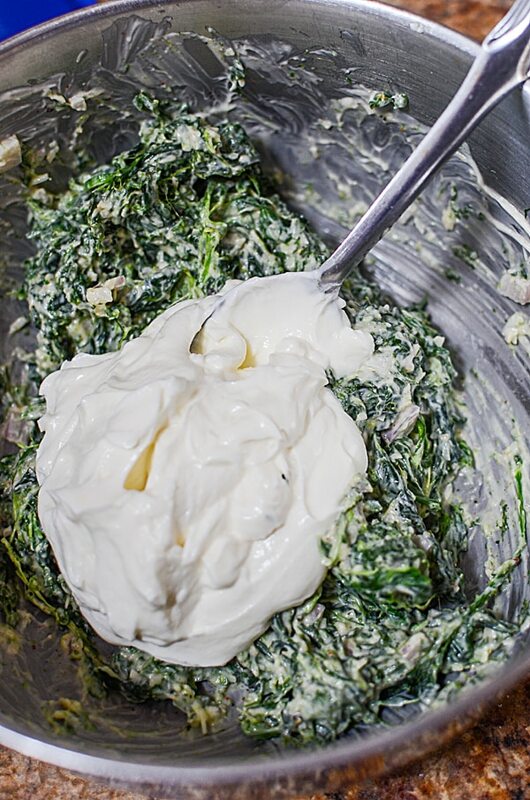 Now that you have the ingredients, it’s time to whip them all together to create the Best Spinach Dip Recipe ever! And nobody has to know just how simple it is! 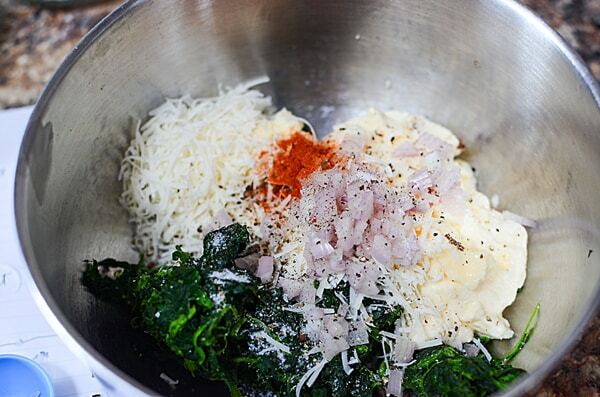 In a large bowl, stir together the chopped spinach, mayonnaise, Parmesan cheese, shallot, garlic, salt, pepper and cayenne. How great is that?! You just ended up mixing a majority of your ingredients in the first step. I told you this was going to be a super easy recipe to make! Make sure you mix everything together well, and if it makes it easier for you, feel free to add in one ingredient at a time to mix together. This may help you to mix it better and make sure you don’t forget anything. Also feel free to mix it together with your fancy Kitchen-Aid mixer, your handy hand-mixer, or with a good old-fashioned spoon and manpower. Now that you have all of the other ingredients mixed well together, for the final ingredient – the Greek yogurt – mix that in now, as well. Mix until it is thoroughly incorporated and smooth. Now, cover with saran wrap or aluminum foil and refrigerate for at least 1 hour. You will want this to firm up before serving, in order to have it spread better and be more consistent. Voila! You’re done! Now all you have to do is pretty it up and serve however you may see fit. 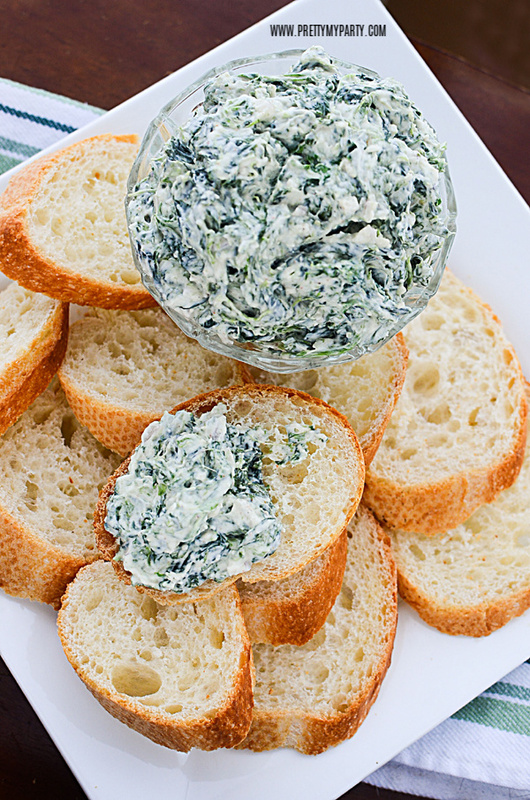 I love to serve this Spinach Dip Recipe with bread, or even better, in a bread bowl! It’s so easy to fancy it up and make it appear like way more work than it actually was. Feel free to serve with veggies, crackers or chips, as well. It’s the perfect party appetizer, regardless if you are taking it to an event that you are headed to, or you are serving it at home for the Sunday football game! Another great selling point for this awesome Spinach Dip is that it is very easy to transfer it if you are taking it to a pot-luck or event. Nothing is worse than thinking of a great appetizer that you want to share at your friend’s get-together, just to have it turn into a nightmare to transport in the car. I know there has been more than once where I didn’t think it through and before you knew it, half of it ended up in my trunk or car seat! Also, if you end up with leftover dip (which probably won’t be likely), it can easily be stored in an airtight container in the refrigerator for up to 3 days. Because of how easy it is to store in the refrigerator, you can also make this appetizer the night before your event very easily. I don’t know about you, but I always love making things as ahead of time. It lessens the stress of last-minute appetizer creations, as well as gives me time to work on more time-consuming dishes that I may be creating for a get-together. It’s a win-win! On the flip side, if you are invited to a last-minute event and are scrambling to find that perfect, quick appetizer that will knock everyone’s socks off, this Spinach Dip Recipe should be on the top of your list. While it’s a great recipe to make the night before, it’s also a quick one that can be knocked out quickly before you need to head out. It literally takes minutes to create and with items that you can dip in it being like veggies, chips or crackers, it’s simple to finish the presentation and get the final items you need to serve. Having people over or accepting an invite to someone else’s event shouldn’t be filled with dread and time-filled food creations that make you wonder why you accepted in the first place. Make sure you find a few of these quick, low-key appetizer recipes that can always stay at the top of your list for items to serve. It will make entertaining a complete joy! Have a wonderful time! 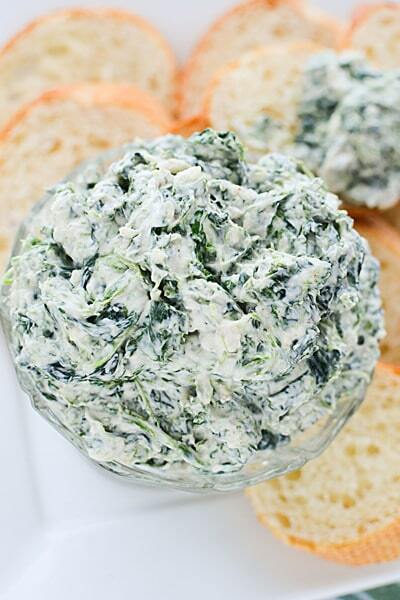 And if you make and love this recipe, don’t forget to give our Spinach Dip a rating below. For more recipe and party ideas, follow us on Instagram @prettymyparty and Pinterest and join us in our private Facebook group. 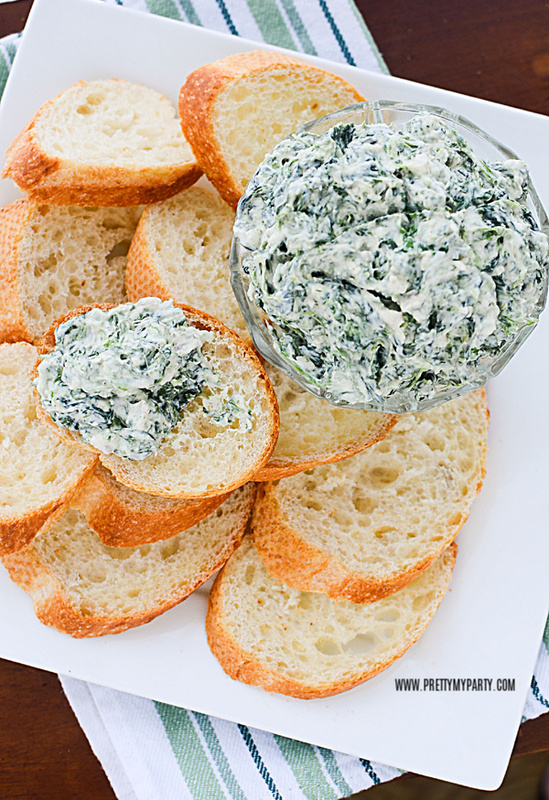 This easy Spinach Dip Recipe makes the perfect appetizer for any party. Whip this dip up in advance and you're ready to entertain. 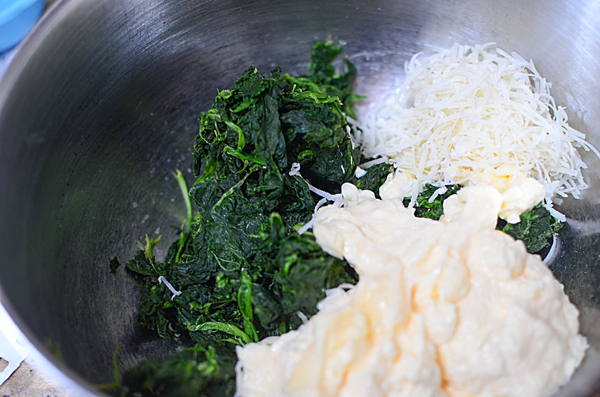 In a large bowl, stir together the chopped spinach, mayonnaise, Parmesan cheese, shallot, garlic, salt, pepper and cayenne. Mix in the Greek yogurt until thoroughly incorporated. Cover and refrigerate for at least 1 hour. Serve with bread, in a bread bowl or with veggies, crackers or chips for the perfect party appetizer. Leftover dip can be stored in an airtight container in the refrigerator for up to 3 days.